Hi loves! Yay, weekend! Gonna enjoy myself, hope you do too ;-). Today I have a lovely creme to show you. I've been showing lots of manicures lately that involve more than 1 polish, or shimmery and glittery finishes, but sometimes all you need is a nice color and a shiny topcoat right? So when I bought some of the China Glaze Avant Garden polishes and brought home Passion For Petals with me, I knew that's the one I wanted to wear first. I needed 2 coats and it applied very easy. No patchy parts and a self leveling formula, just how I like it! The color is hard to describe for me, but I can assure you it's bright and refreshing. 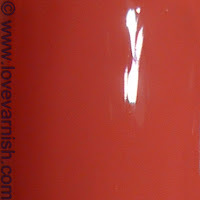 It also leans way more coral on me than what I saw in swatch pictures. Now tell me, do you like this one? Which polishes did you get from this collection? Nice! I don't think i have anything like this in my collection. Love the colour! I don't own anything from this collection (yet). It is totally worth buying it! Thanks Gwen :) the formula is really good so maybe you should get it!